A titan of technological innovation, Steve Jobs thought differently to everyone else. He had the mercurial ability to know what people wanted before they knew it themselves, and what's more, he knew how to sell that idea. An advocator of good design in both function as well as appearance, his influence in Silicone Valley changed the way the world thinks about technology. But how did he achieve such success? What were his methods? 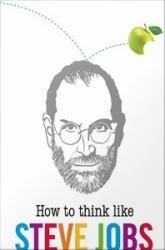 How to Think Like Steve Jobs reveals the philosophies and carefully honed skills Jobs used in his journey to the top and in the consolidation of Apple's unique place in the public consciousness. With his thoughts on innovation, how to find inspiration, presenting an idea, advertising and much more, you can learn how to view the world through the eyes of a genius. The insights this book provides into the mind of the master will have you thinking like Steve Jobs in no time at all. Find Books, eBooks, Bibles, Children's Books, Design Books, Fiction, Graphic Novels, School, Science and Medicine Books -- Books for all Academic Subjects in this Bookshop.